EA Sports revealed the sixteen players that will square off in this year's edition of the Madden NFL video game cover vote during the first round of the NFL Draft on Thursday evening. 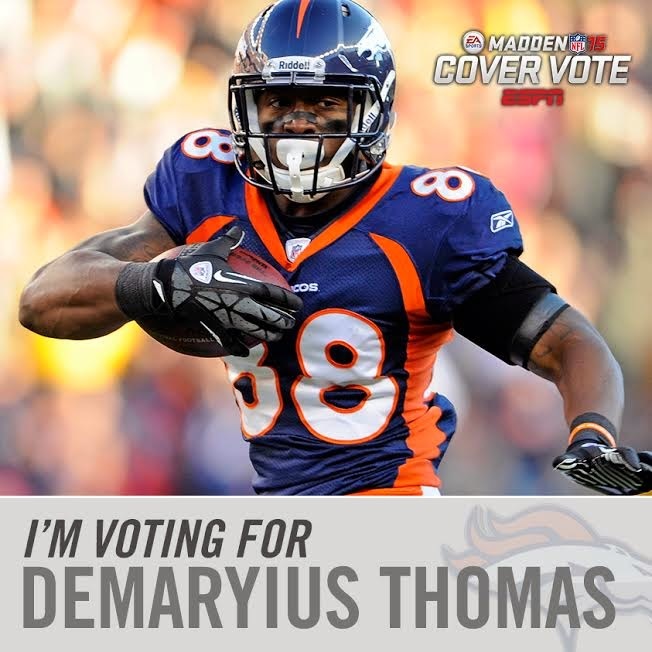 Denver Broncos fifth-year wide receiver Demaryius Thomas is among the candidates to be on the next cover. Thomas, 6-3, 229 pounds, has earned back-to-back Pro Bowl selections over the past two seasons after catching 186 passes for 2,864 yards and 24 touchdowns since quarterback Peyton Manning arrived in Denver via free agency in 2012. Thomas is a long shot to make it past it past the first round of voting as he is up against the reigning Defensive Player of the Year—Carolina Panthers linebacker Luke Kuechly, who was featured in the game's first promo video earlier this month. In addition to Thomas and Kuechly, Bears receiver Alshon Jeffery, Saints tight end Jimmy Graham, Packers running back Eddie Lacy, 49ers quarterback Colin Kaepernick, Eagles quarterback Nick Foles, Panthers quarterback Cam Newton, Steelers receiver Antonio Brown, Chiefs running back Jamaal Charles, Bengals receiver A.J. Green, Eagles running back LeSean McCoy, Colts receiver T.Y. Hilton, Colts quarterback Andrew Luck, Redskins running back Alfred Morris, and Seahawks cornerback Richard Sherman have also been nominated to grace the cover. Sherman and Kuechly are the favorites to win the vote. Madden 15 will hit stores August 26. Fans can vote for the cover athlete at ESPN.com.